Antoine De Saint-Exupery’s beloved masterpiece gets updated. 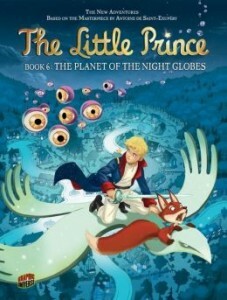 The Little Prince (http://home.pacific.net.hk/~rebylee/text/prince/contents.html) is one of the most loved books on the planet. Five years ago the author’s estate decided to revive the story with a series of new adventures presented in a graphic novel format. What is a graphic novel? Will Eisner describes it as “sequential art, ….a series of illustrations which, when viewed in order, tell a story.” A graphic novel is story and art tied together. Educators, parents,and librarians are realizing the readability factor that a graphic novel has. Readers as young as first and second graders are drawn to the wonderfully drawn illustrations and stay to read the words. The format has changed, but the characters stay true to the original. There the Little Prince was responsible only for his tiny planet — Asteroid B612. Now he feels himself responsible for other stars and planets too. In The Planet of the Night Globes the Little Prince comes up against the Globes — strange creatures who seek food in the dark of the night. When Laudion, the lamp maker, lights up the city night and day, the Globes cannot get to their food. The townspeople perceive the Globes as a threat. The Little Prince and Fox get to the bottom of that mystery. Laudion is shown for what he is, and also shown what he can be. “You’re not my enemy, Laudion. My real enemy is the snake, who took advantage of the fear that was eating at you and making you so miserable.” Laudion performs the last heroic deed that saves the planet. “We’re always afraid of what we don’t understand. Courage doesn’t mean getting rid of our fear, but finding a way to rise above it.” The philosophy of the original continues in the new graphic stories. A worthwhile addition to all reading lists. Why Should I Walk? I Can Fly!